Existing from 3 January 1958 to 31 May 1962, the West Indies Federation, was a short-lived political union between various islands in the Caribbean that were colonies of the United Kingdom. Established on 3 January 1958, the West Indies Federation comprised the 10 territories of Antigua and Barbuda, Barbados, Dominica, Grenada, Jamaica, Montserrat, the then St Kitts-Nevis-Anguilla, Saint Lucia, St Vincent and Trinidad and Tobago. British Guiana (Guyana) and British Honduras (Belize) held observer status within the West Indies Federation. The Federation was established by the British Caribbean Federation Act of 1956 with the aim of establishing a political union among its members. The expressed intention of the Federation was to create a political unit that would become independent from Britain as a single state – possibly similar to the Canadian Confederation, Australian Commonwealth, or Central African Federation; however, before that could happen, the Federation collapsed due to internal political conflicts. West Indian nations of The Bahamas, Bermuda, Belize, the British Virgin Islands, and Guyana opted not to join because they believed that their future lay with association with North America (for both the Bahamas and Bermuda), Central America, and the United States Virgin Islands. Guyana opted not to join at that time due to its ongoing political and internal struggles for independence from the UK, started in the 1950s. The total population of the West Indies Federation was between 3 and 4 million people, with the majority being of black West African descent. Minorities included Indians from the subcontinent (called East Indians), Europeans, Chinese, and Caribs. There was also a large population of mixed descent. Due to the significant cultural ties to Britain, the majority of citizens were Protestant, with significant numbers of Catholics and some Hindus and Muslims (both almost exclusively from the East Indian population). 22 April 1958-Port of Spain, Trinidad-General view of the chamber during the Inauguration of the Federal Legislature of the West Indies. 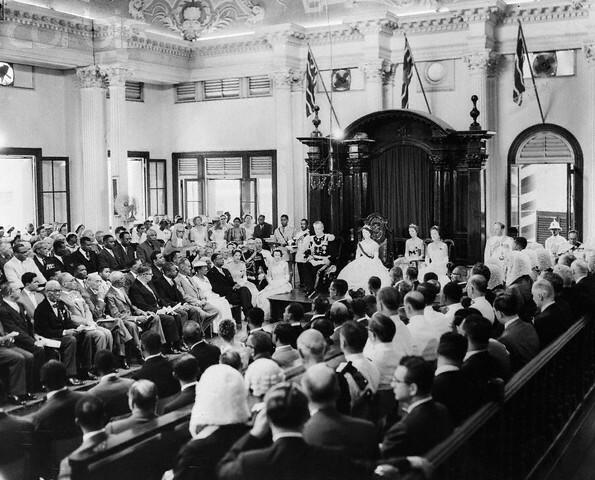 The ceremony, officiated by Princess Margaret, brought into formal being the newest member of the British Commonwealth, the West Indies Federation. Seated to the left of the Princess in this photo is Lord Hailes, Governor-General of the Federation. The Governor-General was Patrick George Thomas Buchan-Hepburn, 1st Baron Hailes, GBE of Britain and the Prime Minister was Sir Grantley Adams, (Premier of Barbados). The Council of State was presided over by the Governor-General. The Council included the Prime Minister and Members of the Cabinet as well as three senators and three civil servants. The Governor-General chose the Senators and civil servants. (The Council of State was the principal policy (decision)-making body at the start of the Federation. In 1960, Britain agreed to abolish this Council and allow the Cabinet to take over the powers of the Council). There was one woman on the Council of State, The Hon. Mrs. Phyllis Byam Shand Allfrey, who served as Minister of Labour and Social Affairs. The Legislative Branch of the West Indies Federation – the Federal Parliament - was bicameral, consisting of a nominated Senate and a popularly elected House of Representatives. The Senate consisted of 19 members. The Governor-General appointed these members, after consulting the respective territorial governments. Two members represented each unit (with only one from Montserrat). The House of Representatives had 45 total elected members. The distribution of seats was in relation to the size of the territories. In order that there would be continuous representation for Montserrat, the electors chose an alternate member who would be entitled to sit when the substantive member was absent through illness or with leave of the Federal Legislature. Two Federation-wide parties were organised as confederations of local political parties. Both were organised by Jamaican politicians: The West Indian Federation Labour Party (WIFLP) by Norman Manley, and the Democratic Labour Party (DLP) by Alexander Bustamante. In broad terms, the WIFLP consisted of the urban-based parties throughout the Federation, while the DLP consisted of the rural-based parties. The platforms for the two major national parties were similar in many respects. Both advocated maintaining and strengthening ties with the United Kingdom, United States, and Canada (countries with which the islands had strong cultural and economic links); encouraging and expanding tourism; working to bring British Guiana and British Honduras into the Federation and to obtain loans, financial aid, and technical assistance. Despite these similarities, there were differences. The WIFLP had advocated the encouragement of agriculture while the DLP had promised a climate favourable to both private industry and labour, development of human and economic resources. The WIFLP promised to encourage the Bahamas (in addition to British Guiana and British Honduras) to join the Federation, whereas the DLP did not. The WIFLP also campaigned to establish a central bank for the extension of credit resources and advocated a democratic socialist society and full internal self-government for all the unit territories, whilst avoiding the issues of freedom of movement and a customs union. The DLP said nothing about full internal self-government, attacked socialism, wished to avoid high taxation (via loans and technical aid) and emphasized West Indian unity, freedom of worship and speech, and encouragement of trade unions. Federal elections were held on 25 March 1958. Preparation for the election began in 1957. As no Federal Laws were in existence, the laws in force in each constituent territory were used, as was permitted by Sub Section2 of Section 1 of the West Indies (Federation) Order in Council 1957 and Article 107 of the Constitution of the West Indies. Under these, the local legislation was adapted and modified to meet the needs of the Federal General Election. The WIFLP won the election, winning 26 seats while the DLP carried 19 seats. The bulk of the WIFLP seats came from the smaller islands while the DLP carried the majority in Jamaica and Trinidad & Tobago. 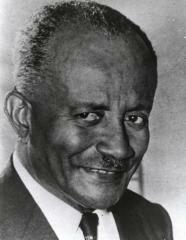 Since neither Manley nor Bustamante had contested the Federal elections, Sir Grantley Adams became the Federal Prime Minister, while Ashford Sinanan (DLP) was the Leader of the Opposition. There were two women in the House of Representatives, Florence Daysh from Barbados, and Phyllis Shand Allfrey of Dominica. The Senate was appointed in April 1958, shortly before the opening of Parliament. In appointing the Senate, Governor-General Lord Hailes realized that only the St Vincent island government was DLP controlled and, as a result, the Senate was going to be disproportionately pro-WIFLP. In a controversial decision, he contacted the opposition DLP groups in Jamaica and Trinidad, and appointed one DLP Senator from each of those islands. Thus, the Senate consisted of a total of 15 WIFLP members and 4 DLP members. There were two women Senators - Mrs. Bertha Higgins of Antigua and Barbuda and Mrs. Margurite Wyke of Trinidad and Tobago. The Judicial Branch of the West Indies Federation was represented by the Federal Supreme Court consisting of a Chief Justice and three (later five) other Justices. The Federal Supreme Court, established in 1957, itself was the successor to the West Indian Court of Appeal (established in 1919); and had exclusive original jurisdiction and an appellate jurisdiction over the same territories (Barbados, British Guiana, the Leeward Islands (including the British Virgin Islands), Trinidad & Tobago and the Windward Islands) in addition to Jamaica and its dependencies. Under the 1956 British Caribbean Federation Act though, the Federal Supreme Court did not have any jurisdiction over British Honduras, as the British Honduras (Court of Appeal) Act, 1881, (which allowed for appeals from the British Honduras Supreme Court to go the Privy Council or the Supreme Court of Jamaica) was repealed under it. There was an executive Judicial Service Commission for the appointment of federal judges (other than the Chief Justice) and certain officers of the Supreme Court. Three Member States were proposed for capital city of the Federation. These were: Jamaica, Barbados and Trinidad and Tobago; although earlier in the federal negotiations the general opinion had been that the capital should be one of the smaller islands so that the capital would be in a neutral position to the larger territories and it would be able to inject some buoyancy into one of the (then) poorer economies. To this end, Grenada was originally "tentatively" selected as the member state to host the capital, but this was abandoned after protests from some of the parties involved and at the London Conference, the smaller islands were ruled out for consideration. Within Trinidad and Tobago, the first proposed site was Chaguaramas, a few miles west of Port of Spain, Trinidad and Tobago, but the site was part of a United States naval base. In practice, Port of Spain served as the de facto federal capital for the duration of the Federation's existence. The federation held all the trappings of nationhood, with a federal flag and coat of arms, parliament, civil service and judiciary. The coat of arms of the West Indies Federation was used between 1958 and 1962. The background of the shield bore four equally-spaced narrow white stripes with a ten orange-gold discs representing each island grouping, undulating horizontally across a blue field representing the Caribbean Sea and the sun shining upon the waves. A triangle is superimposed on the shield, and the shield is topped by a British lion. The scroll beneath proclaims To Dwell Together In Unity. The shield is supported on either side by the country's national bird, the pelican, with wings extended. Above this is a helmet topped with a flaming torch held by an upright arm. The torch signifies a beacon to light a path. The flag of the West Indies Federation was used between 1958 and 1962. 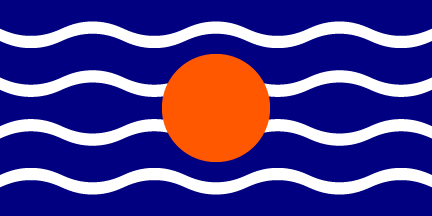 It bore four equally-spaced narrow white stripes with a large orange-gold disc over the middle two lines in the center of the flag, undulating horizontally across a blue field representing the Caribbean Sea and the sun shining upon the waves. The flag was originally designed by Edna Manley. During the Federation's existence, each member continued to issue its own postage stamps as before; but on 22 April 1958, the members (except for the Cayman Islands) each issued a set of three commemorative stamps. All of these stamps used a common design depicting a map of the Caribbean and a portrait of Queen Elizabeth II, with an inscription at the top reading "THE WEST INDIES / FEDERATION 1958" at the top and the name of the member at the bottom. During its brief existence (1958 – 1962), a number of fundamental issues were debated with a view to strengthening the Federation. Among these were direct taxation by the Federal Government, Central planning for development, Establishment of a Regional Customs Union and Reform of the Federal Constitution. The issue of direct taxation was particularly controversial. The Federation was not permitted to levy (impose) income tax for at least the first five years of its life. Added to this, were the greatly differing positions among the Territories with respect to how other federal taxes should be levied. In addition, the Federation began quickly to seek to establish federal institutions and supporting structures. It created a federal civil service; established the West Indies Shipping Service (in 1962) to operate two multipurpose ships – the Federal Maple and the Federal Palm - donated to it by the Government of Canada. It had embarked also on negotiations to acquire the subsidiary of the British Overseas Airways Corporation (BOAC), namely British West Indies Airways (BWIA). Cooperation in tertiary education was consolidated and expanded during this period. The West Indian Meteorological Services was established. The then University College of the West Indies (UCWI), which was established in 1948 with one campus at Mona, Jamaica, opened its second campus at St Augustine, Trinidad and Tobago, in 1960. These new regional organizations joined others already in existence, such as the Caribbean Union of Teachers, established in 1935; the Associated Chambers of Commerce, organized in 1917; and the Caribbean Labour Congress, inaugurated in 1945. The Advisory Services of the Federation included Agriculture, Civil Aviation, Education, Fisheries, Forestry, Livestock, Maritime Services, Marketing, Medicine, Postal Services, and Telecommunications. The Federation however faced several problems. These included the governance and administrative structures imposed by the British; disagreements among the territories over policies, particularly with respect to taxation and central planning; unwillingness on the part of most Territorial Governments to give up power to the Federal Government; and the location of the Federal Capital. The West Indies Federation had an unusually weak federal structure. For instance, its provinces were not contained in a single customs union. Thus, each province functioned as a separate economy, complete with tariffs, largely because the smaller provinces were afraid of being overwhelmed by the large islands' economies. In addition, complete freedom of movement within the Federation was not implemented, as the larger provinces were worried about mass migration from the smaller islands. Many reasons have been proposed to explain the demise of the federation. These include the lack of local popular support; competing insular nationalism; the weakness of the Federal government; prohibitions on Federal taxation and freedom of movement; and inadequacies in the federal constitution. In addition, there were fundamental changes made to the constitution very early in its existence; political feuds between the influential leaders; the decision of the three most influential politicians not to contest Federal elections; friction between these leaders and the Federal government; and the overwhelming concentration of population and resources in the two largest units. Finally, there was geographic and cultural distance between the units; the lack of a history of common administration, and the impact of the period of self-government that followed the promotion from Crown Colony system. Jamaica was remote from most of the other islands in the Federation, lying several hundred miles to the west. Jamaica's share of the seats in the federal parliament was smaller than its share of the total population of the Federation. It was believed that the smaller islands were draining Jamaica's wealth. There were also problems with the Federation's proposed capital in Chaguaramas, at that time still in the hands of the United States (having leased it as a naval base from the United Kingdom during World War II). Many of the Caribbean provincial leaders wanted Chaguaramas to be the Federation's capital. Provincial leaders such as Norman Manley of Jamaica and Dr Eric Williams pushed for handing over of Chaguaramas to the Federation from the US. However, the US and the UK disagreed and the Federation's Prime Minister Grantley Adams denied the provincial leaders from obtaining Chaguaramas. For many Jamaicans it appeared that the Federation would then just hamper their development and movement towards independence. As a result, the Bustamante-led Jamaica Labour Party (the local component of the West Indian DLP) successfully forced Manley to hold a referendum in September 1961 on political secession from the Federation. It passed, with 54% of the vote (251,776 votes to secede versus 216,371 to remain), despite the opposition of Manley, the province's Chief Minister at the time. 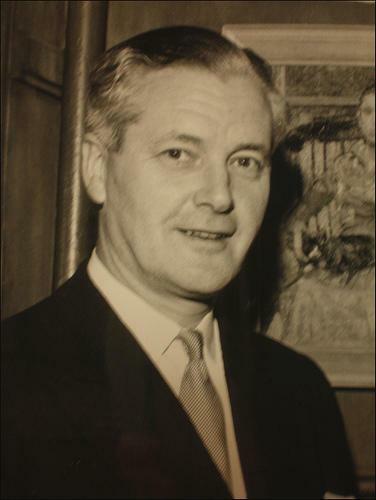 Manley himself lost the subsequent island elections in April 1962, and Bustamante became the first Prime Minister of an independent Jamaica on 6 August 1962. After Jamaica left, there was an attempt to salvage a new federation from the wreckage of the old. Much depended on Premier Williams of Trinidad and Tobago, who had stated previously that he wanted a "strong federation." Premier Vere Bird of Antigua responded that his province would only be in a federation with Trinidad as an equal partner, not as "a little Tobago." He did indicate that a strong federation was acceptable if no attempt was made to create a unitary state. The federation was dissolved on 31 May 1962. 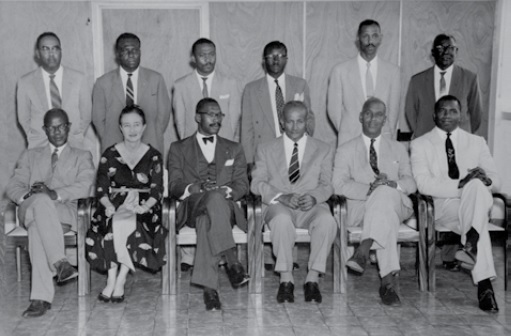 The closing of the Common Services Conference in Port of Spain in July 1962, completed the liquidation of the Federation. By November, Williams indicated that he was now in favour of the idea of a unitary state. Failing that, he resolved to take Trinidad and Tobago into independence. In this, he was buoyed by his re-election as Trinidadian leader on 4 December 1961. Later that December, Premier Errol Barrow of Barbados met with Williams, but failed to persuade him to keep Trinidad in the Federation. On 14 January1962, the People's National Movement (the Williams-led Trinidad component of the WIFLP) passed a resolution rejecting any further involvement with the Federation. Williams himself stated "one from ten leaves nought" – in other words, without Jamaica, no Federation was possible. Trinidad and Tobago became independent on 31 August 1962. Montserrat remained an overseas territory of the United Kingdom. 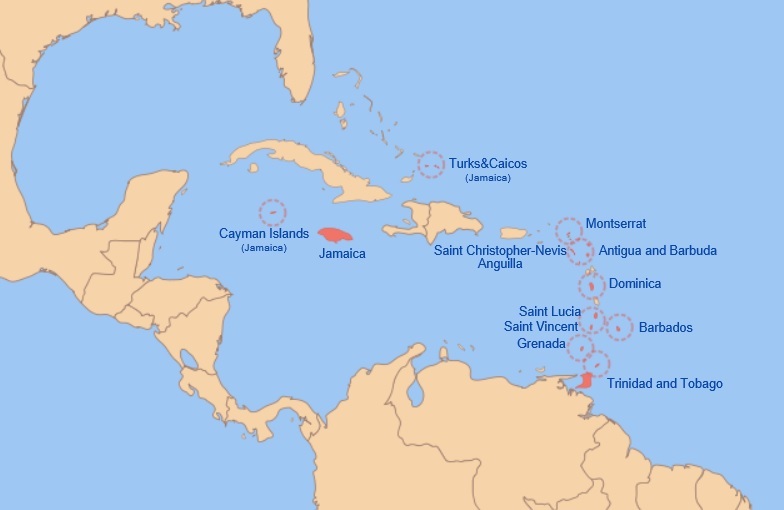 The Cayman Islands and Turks and Caicos Islands had been separated from Jamaica upon the latter's independence in 1962; Anguilla was separated from Saint Kitts and Nevis in 1980. All three remained UK territories as well. The Federal Supreme Court would also be succeed by a British Caribbean Court of Appeal (1962–1966) and then a West Indies Associated States Supreme Court (Court of Appeal and High Court) (1967–1980) and ultimately by an Eastern Caribbean Court of Appeal and Eastern Caribbean Supreme Court in 1981 for the OECS. More recently a Caribbean Court of Justice has been established which would also fulfil the role of the original Supreme Court if all members accede to the court's appellate jurisdiction. Another lasting regional fixture, officially created before the Federation, is the University of the West Indies. During the Federation, the University pursued a policy of regional expansion beyond the main Jamaica campus. Two other campuses were established: one in Trinidad and Tobago established in 1960, and one in Barbados, established a short time after the Federation dissolved in 1963. Since 2004, the West Indies Federal Archives Centre has been located on the University's Cave Hill campus in Barbados. The initial federal attempts never went so far as to try to encompass all of the British West Indies (BWI), but were more regional in scope. The historical regional groupings included the British Leeward Islands, British Windward Islands and Jamaica with nearby colonies. The idea of a West Indies Federation dates back to 1682 when the Leeward Islands of Antigua, St-Kitts-Nevis-Anguilla, Montserrat, the British Virgin Islands and Dominica included in the Leeward Islands, joined in a Federal Assembly. However, the island2 did not actually federate until 1705. The association broke down in 1798. Repeatedly in the nineteenth century, Britain considered the advantages of a West Indian Federation, but for a variety of reasons, nothing constructive was done. In 1871, a loose administrative federation was imposed on the Leeward Islands, which merged into the larger experiment in 1958. A similar attempt was made among the Windward Islands of Grenada; St. Lucia and St. Vincent after 1871, but it was short-lived.